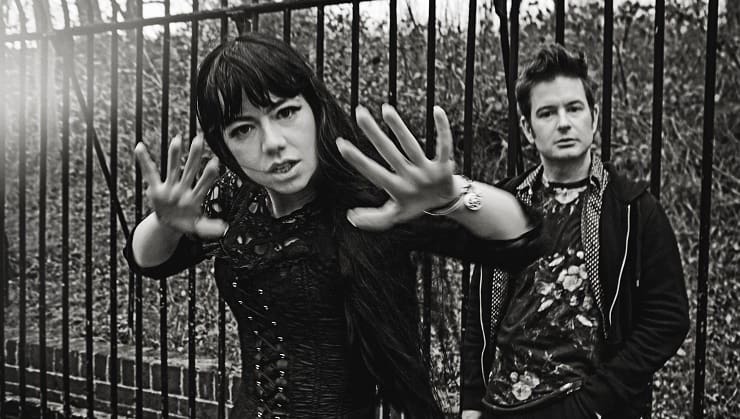 Formed in Bristol and now based in Camden Town, London, BELLA LOKA are indie-electronic duo Tea & David Boothby. With a sound that blends the distinctive and expressive vocals of Tea Boothby with indie-pop electronica and David Boothby’s guitar textures, BELLA LOKA condense heavy, searching lyrical themes into deceptively upbeat alt-pop songs. The duo are currently recording their debut album at the world-famous Abbey Road Studios after coming to the attention of in-house producers Rob Cass & Pearse MacIntyre (Cave Productions). Vocalist and songwriter Tea Boothby is also a film-maker and artist, and is responsible for creating all of BELLA LOKA’s artwork and music videos from conception to post-production. BELLA LOKA’s dynamic live performances have been popular at UK festivals and clubs, and the shows are regularly enhanced with visual projections designed by Tea and performances of her poetry alongside the songs. 2016 looks to be a busy and vibrant year for the duo with the release of 2 EPs and a debut album accompanied by live shows. Indie electro-pop duo Bella Loka are pleased to present their new single, ‘Honey B’, via DEFDISCO. The sparkling new song offers a taste of the pair’s forthcoming debut album set for release later this year. The track takes a vibrant stroll though simmering synthesizers, clasping drums and soaring melodies. The glossy electro-pop duo’s sound is reminiscent of artists like Marina & The Diamonds, Violins For Milk, and Little Boots, while remaining on an unparalleled and sparkling pedestal all on its own. Coupled with B-side ‘We Are Young’ – a carefree and gentle lullaby of acoustic guitars and breathy vocals – the single amplifies the pair’s love for a catchy hook and lush melodies. Made up of Tea and David Boothby, Bella Loka originally hail from Bristol, but now reside in Camden Town, London. With a sound that blends the expressive vocals with indie-pop electronica textures, the band condenses heavy, soul-searching lyrical themes into deceptively upbeat alt-pop songs. During their live performances, the band’s songs often stand side-by-side with singer Tea’s own poetry readings, adding another candid dimension to the duo’s impressive range of talents. The multi talented Tea is also responsible for producing and directing the band’s music videos, showcasing her skills behind the camera alongside writing infectiously beautiful pop songs. Signed to DEFDISCO, a new and thriving independent record label who are home to artists like hip-hop legends Public Enemy, Lovestarrs, and 88 Killa, Bella Loka were first spotted by the label whilst recording their album at the famous Abbey Road studios during a session with in-house producers Rob Cass and Pearse Macityre (Cave Productions). Understanding the importance of artists shaping their own sonic aesthetic and identity, Bella Loka were heavily involved with the production of the album and worked closely with Cave Productions to create their new record. No strangers to hard work, Bella Loka’s journey has been one of ambition, graft, and persistence. With the release of ‘Honey B’, coupled with their forthcoming debut album, Bella Loka ascent to the top of the pop world is set to reach new and dizzying heights.